When the Wharton Esherick Museum had to take down a large Oak tree that stood outside Wharton’s Studio for over 80 years the Curator asked the Keystone Woodturners if it would be possible to salvage any of the tree for gifts to the Volunteers and Staff to serve as mementoes. 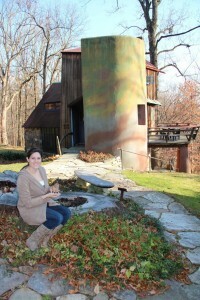 Although the tree was severely rotten and cracked throughout, we suggested that pens could be made from the wood. 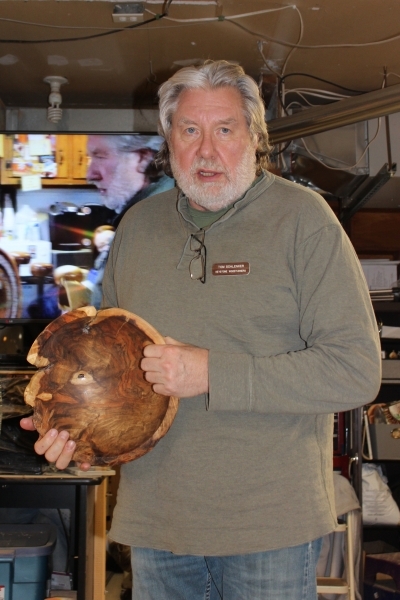 A team of Les Bailey, Don Finn, Harry Pye, Liz Rutter, and Bob Zrebiec dried the wood, cut the blanks and using pen kits provided by the Museum, turned 100 pens in four different styles. The pens were a great hit among the Museum’s Board of Directors, Staff, and Volunteers and there were enough pens left over to sell in the Museum’s gift shop. 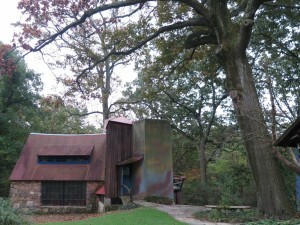 The Wharton Esherick Museum with the Oak tree in the foreground. 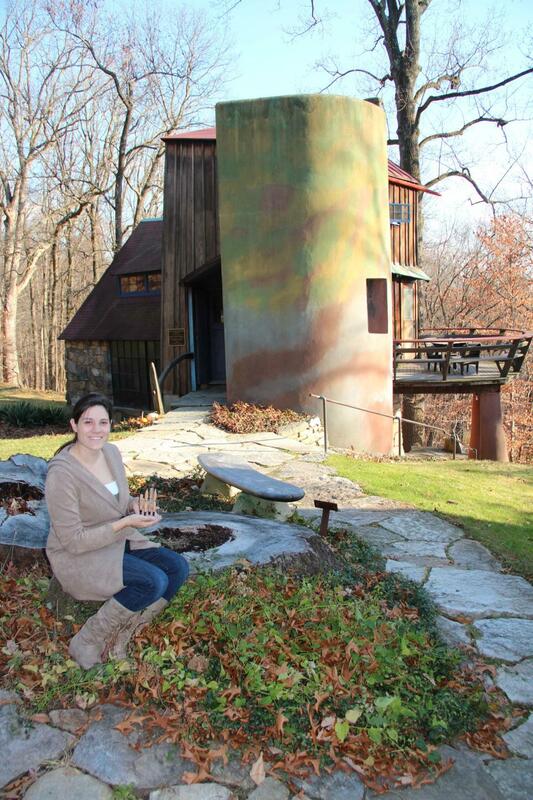 Museum Curator Laura Heemer with turned pens on the tree stump. 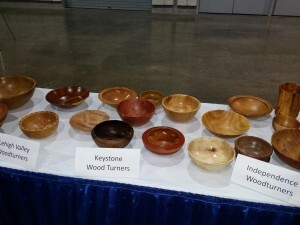 As a Community Service Project during the Pittsburgh Symposium, each AAW chapter was invited to turn and donate bowls that could be sold at auction with the proceeds benefiting Children’ s Charities in Pittsburgh. 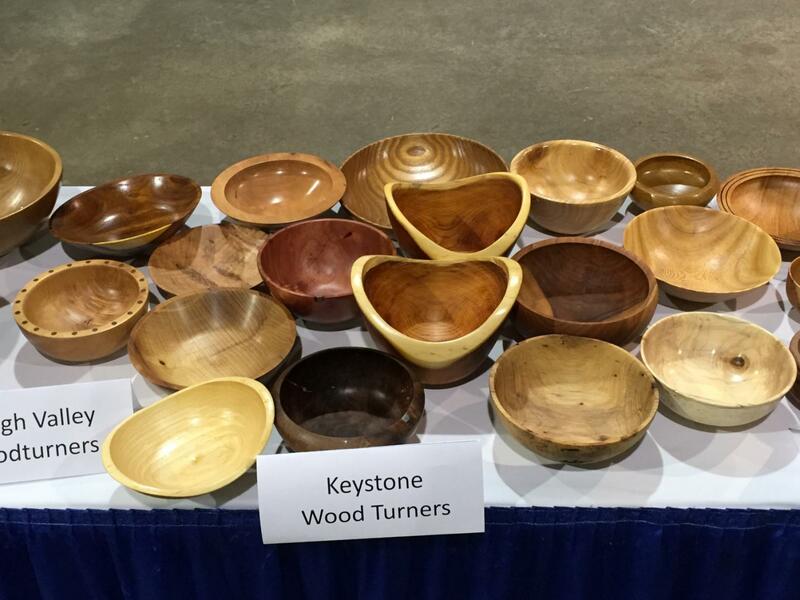 Our President Les Bailey issued a challenge to the membership to turn bowls that our chapter could donate. 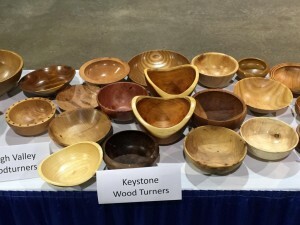 Although only 10 Keystone Members were able to attend the Symposium, 23 members made a total of 26 bowls that were brought to the event and donated. 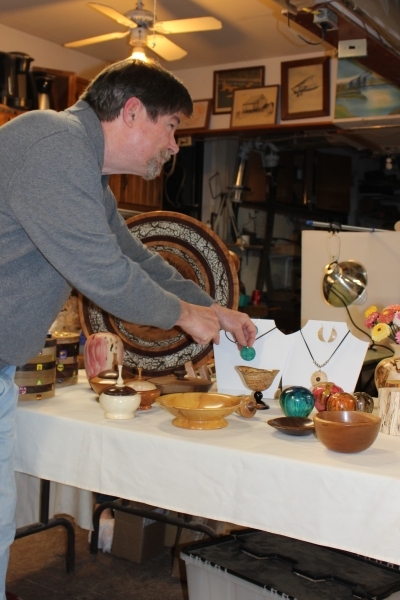 Members who donated one or more bowls were: Les Bailey, Jim Bewley, Bernie Brownstein, Charlie Carter, Carol Hall, Mark Hall, Suzanne Kahn, Jim Kelly, Pat McBride, Joe McCann, Bill Pendlebury, Mark Pinder, Harry Pye, Tom Schlenker, Tom Sell, Rob Shafer, Bobby Simms, Jesse Smith, Greg Teter, Ralph Walters, Bill Yoder and Bob Zrebiec. The program raised over $ 11,000. 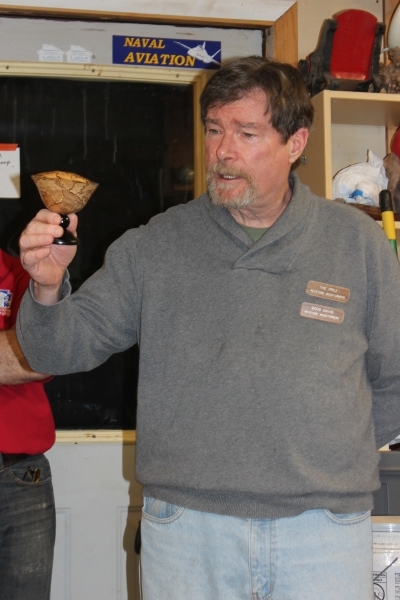 Because of the large numbers of bowls that were received only a few could be shown at any one time during the symposium. The pictures below show some of our bowls at different times during the Symposium. Beads of Courage is a nonprofit that provides innovative, arts-in-medicine supportive care programs to transform the treatment experience for children coping with serious illness. Through the Beads of Courage, children receive a unique bead to represent each procedure or treatment they undergo. Woodturners have been making containers to hold the beads, and our President, Les Bailey, issued a challenge for our membership to make and donate bowls to Children’s hospitals in the Philadelphia area. 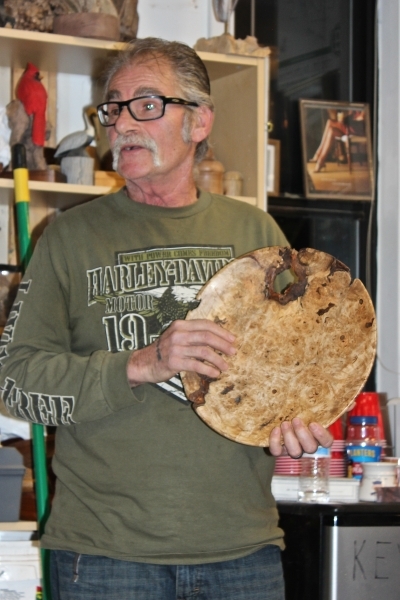 Because the bowls needed to be quite large and the wood needed to be dry, making them would be quite a challenge. 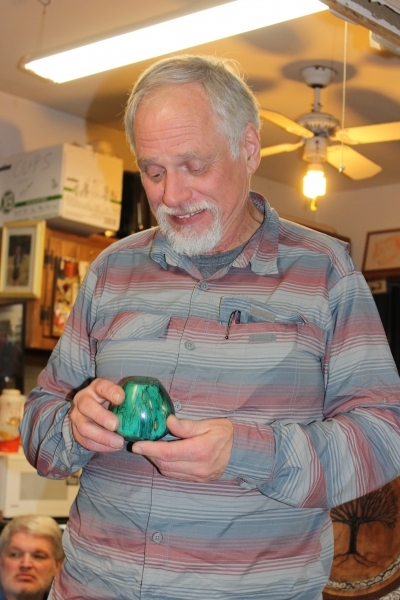 Nevertheless, Bernie Brownstein stepped up to lead our effort, and 16 of our members responded, each making one or more bowls for a total of 27. They were Bob Antonishak, Les Bailey, Dave Brethauer, Bernie Brownstein, Doug Davis, Kevin Manning, Pat McBride, Joe McCann, Bill Pendlebury, Harry Pye, Tom Schlenker, Tom Sell, Bobby Simms, Jesse Smith, Ralph Walters, and Bob Zrebiec. 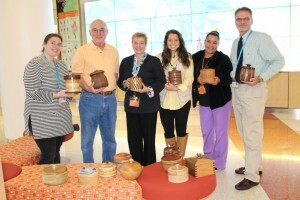 Half of the bowls were presented to the Children’s’ Hospital of Philadelphia (CHOP) on Tuesday October 27 by Bernie Brownstein and Bob Zrebiec and the other half to DuPont Children’s Hospital on Wednesday October 28 by Bernie Brownstein. Pictures of the presentations are shown below. The bowls may also be viewed in the Gallery tab of this site (2015 July, September, October). 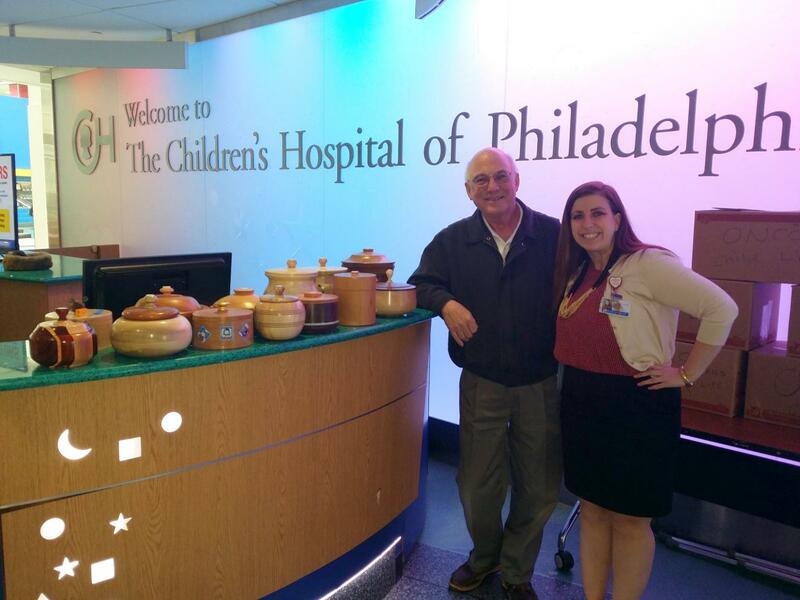 Children’s Hospital of Philadelphia presentation October 27, 2015. DuPont Children’s Hospital presentation October 28, 2015. This entry was posted in news on December 14, 2015 by Mark Hall.